A juicer is a small kitchen appliance designed for squeezing or extracting juice from various foods, especially fruits and vegetables, for the purpose of drinking or adding extra flavour to other foods. Although a hand juicer may be handy to have in the kitchen (it doesn’t require electricity and is pretty inexpensive), with all the fancy electric juicers available on the market today, this ‘once good kitchen tool’ doesn’t get much attention anymore. Still, juicers, hand and electric ones, are available in numerous different models. So whether you want a hand or an electric juicer, it’s a good idea to get to know your options in order to make the best decision. A hand juicer can come in various different shapes and sizes. It is often the most affordable option, but also takes the most amount of time to make a juice. However, there are some people who swear that hand juicers actually produces a much sweeter, higher-quality juice than other types. Electric juicers works similarly to hand juicers, but they feature an electric motor, which means that they are more efficient and allow you to juice produce faster. Different juicer models make different types of juices. While some juicers just make a juice water, which is the juice that comes from the segments of the fruits, other types are capable of producing a real juice, which is taken from the segments and the pith. This juice is healthier, but it also requires a quality juicer. Whether looking for a higher-quality juicer that makes total juice or a model that juices all kinds of fruits and vegetables and even wheatgrass, you should do a research on each model. Look and compare different juicers and find out which features each one offers. This is the best way to find out which juicer will best suit your needs. A hand juicer usually features a handle that allow you to press the fruit against the grater more effectively, so you can get more juice out of it. 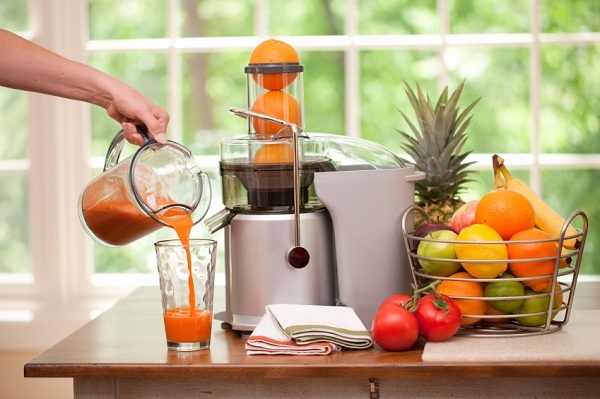 This juicer type is easy to use and usually takes up less space than an electric option. But on the other hand, preparing a juice with a hand juicer takes a little more work, since you are juicing without the help of the electric motor. Electric juicers feature an electric motor which spins the reamer very quickly. There are some models that can even spin the reamer back and forward for a better juicing action. With an electric juicer you will be able to prepare a juice in less time, but sometimes the juice isn’t as sweet because the reamer gets some of the bitter oil from the peel into the juice. Again, picking the right juicer takes some research. Remember to look for the quality. Keep in mind that if you are really serious about living a healthy lifestyle, which means lots of fresh juices, then having an electric juicer capable to juice all kind of produce might be the best option for you.